DeSean Heckman signed on with Trine University Monday afternoon. Pictured, in front from left, sister, Nykole McGuire (sister), James Zimmerman (brother-in-law), DeSean Heckman, April Grossman (mother) and Matt Grossman (step-father). AKRON — Trine University scooped up another local product earlier this week. 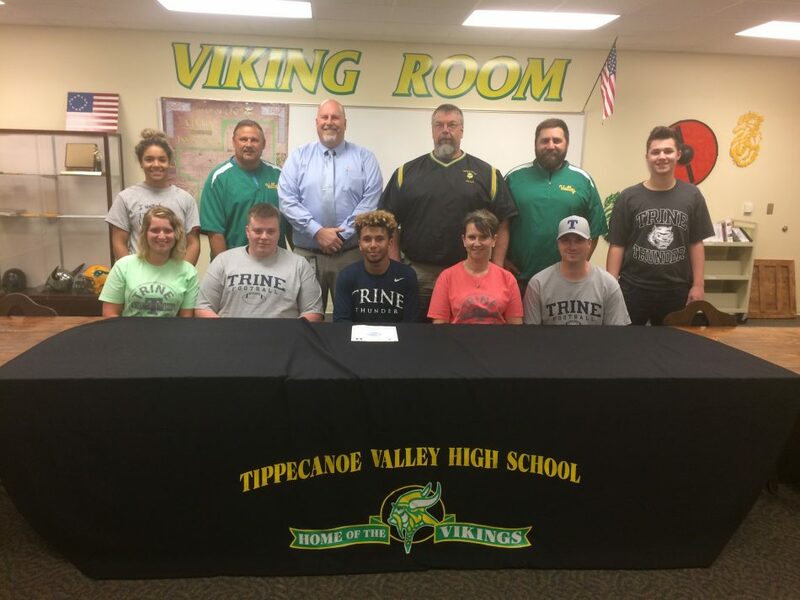 Tippecanoe Valley’s DeSean Heckman signed on with the Thunder to continue his academic and athletic careers alongside his family members and a large compliment of TVHS administration. Heckman spent his senior campaign as running back for the Vikings but has already talked with the coaches and may be finding playing time at somewhere other than the Thunder backfield. Statistics were not available from Heckman’s senior season, but the Viking star scored two touchdowns through the air and averaged over 14 yards per catch during his junior year. Heckman joins a large list of current players from local schools and conferences on Trine’s roster. The Thunder currently boast three players from the Northeast Corner Conference, four from the Three Rivers and six from the Northern Lakes. Heckman plans on studying business.